From our grapes, which we know down to the very last detail, we produce 3 dry wines and a Vin Santo. The Chiassobuio is 90% Sangiovese, harvested entirely from the old vines, that are still grateful to us for saving them from the oak trees and wild roses that were suffocating them. The Cantomoro is 100% Cabernet Sauvignon, and is produced from the grapes of the younger vines. The idea of producing the wine in this way was suggested by the grapes themselves: they were just so different, both as regards the characteristics of the vine as their age, that we had the impression that by blending them we would be diminishing their strengths rather than improving on them. 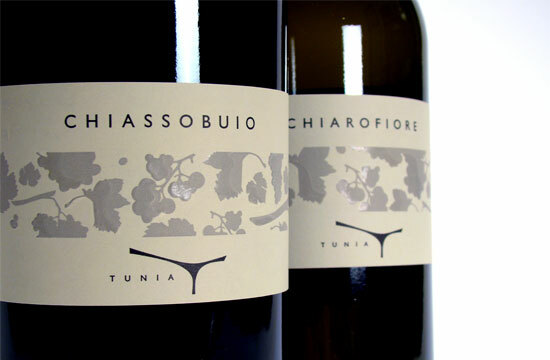 The Chiarofiore is our white wine, and the gentle one in the family. We produce it with Trebbiano and Vermentino, harvested from the old vines in this case too. So it would not feel too different from its brawnier brothers we decided to give it the opportunity to ferment on the skins for a while. The Vin Santo, which is obtained only from Trebbiano grapes, we consider to be both the cross we have to bear and a joy we await. Given just how much work it does involve (complex procedures with the vine; two different harvesting times requiring over 1000 small boxes; 20 km to take the grapes from the vineyard to the area where they are dried; stacking of the boxes in 80 columns that require periodic checks bunch by bunch) it is easy to imagine just how great our expectations are.We can’t wait for it to be ready (though realistically this won’t be before 2014), in the hope that it will be a joy for all who taste it. The pomace of the Vin Santo, to which we have devoted the same attention a child would merit, could not be left in the care of just anyone. This is why we chose the Distilleria Nannoni which repaid our trust by winning the gold medal in 2011 ANAG (Association of liqueur and grappa tasters) competition, in the “Young Grappa” section. Our 600 olive trees, that had remained unpruned for many years , were amazed by our attentions, and decided to repay our kindness by producing olives. Thanks to this combined effort, in 2010 we produced our first extra virgin olive oil.